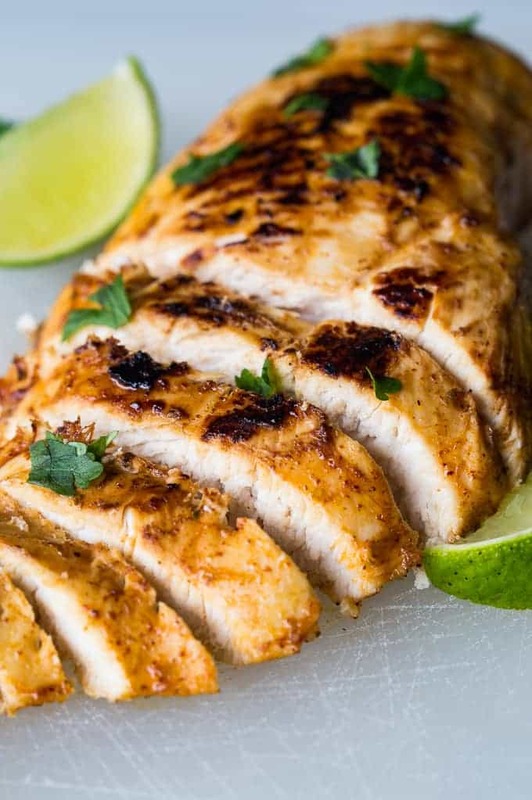 This tender, juicy, zesty chili lime chicken is perfect for topping your salad! 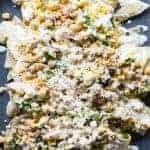 This easy recipe takes just minutes to prepare! Perfect for a weeknight dinner! 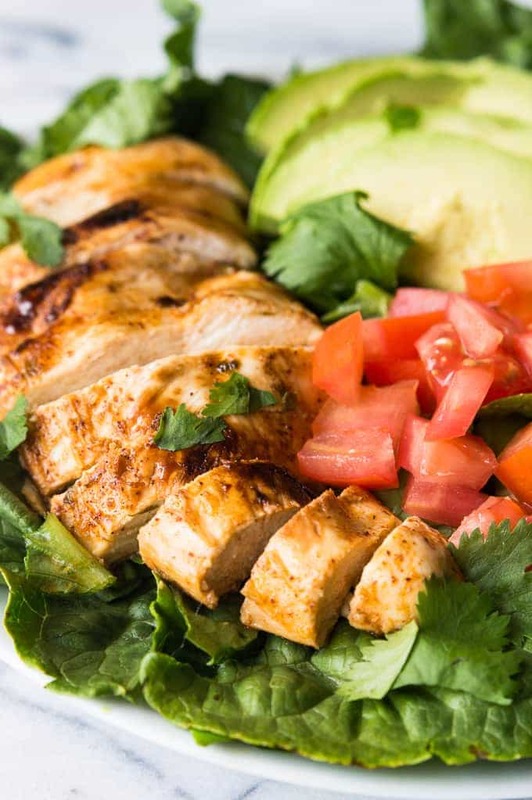 Chili Lime Chicken Salad. Some days just call for salad. But salad never really fills me up. I need a little something more with my salad. That’s where this chili lime chicken comes in. This chicken is bursting with flavor. And I will be completely honest with you, if you don’t like lime, you probably won’t like this chicken. It definitely has a tangy lime flavor to it. With a little pop of heat from the chili powder. It’s everything that it’s name would imply. But if you’re like me and love those flavors then I think this meal will be perfect for you! 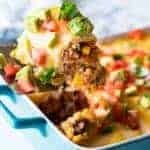 As with all recipes here, this is an easy to make recipe. Perfect for having on a weeknight. The only trick is making sure that you marinade the chicken. So this is a meal that takes a little fore-thought. The chicken will need to marinade for at least 2 hours to really absorb the flavors. Then it’s just a matter of tossing it in a pan and cooking it. If you follow me on snapchat you probably saw me make this a couple of weeks ago. 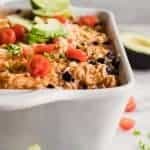 It’s a healthy dinner that is easy to make, it’s filling, and the whole family enjoyed it! Even the pickiest ones of all. Winning! 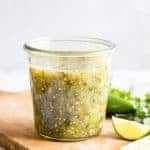 Make sure you snag the recipe for the Creamy Avocado Salsa too, remember that’s the recipe that’s called salsa, but it’s so universal you can use it for a salad dressing also, and it’s perfect on this salad! I hope you enjoy the recipe! You can follow along with me and never miss a recipe by signing up for my newsletter. Also follow me on Instagram and tag #houseofyumm so I can see all the recipes you make 💜 It’s really the best part of my day when I get to hear from you! 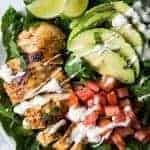 Assemble the salad, layer the lettuce, chicken, tomato, avocado, and drizzle with the Creamy Avocado Dressing. Or any dressing of your choice. This salad is seriously everything! I have some leftover limes and now I know they’ll be put to good use! 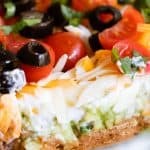 What a perfect quick and easy weeknight dinner! What a delicious and wholesome meal! I’m such a salad girl….and that chicken! Looks fabulous! 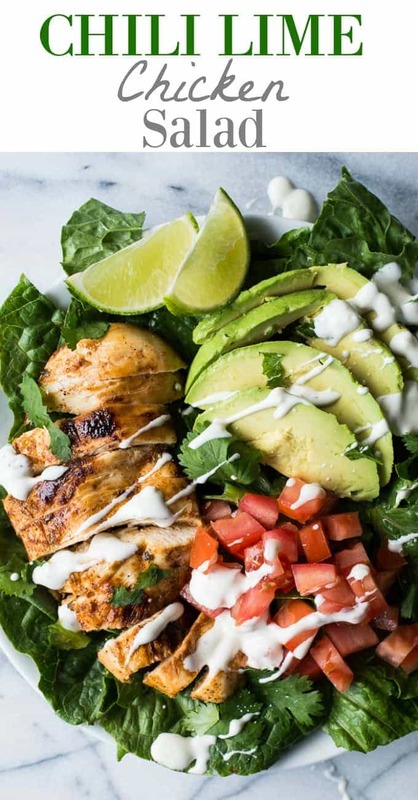 This salad looks amazing and I need to make this asap! I love how juicy it looks. I wish I could have that for lunch right now! I just made it tonight and loved it! It didn’t need salad dressing because the chicken was so flavorful. Yummy. Yes! I will definitely be cooking my chicken this way a lot! So glad you enjoyed 🙂 Thanks! Soooo yummy! Placed chicken and marinade im Ziploc freezer bag two hours. cooked on eacj side ,7 min. Even boiled remaining marinade to add during cooking. Let rest on wooden board then sliced ..so jucy and soft with some crispy edges. Nestled the sliced chicken in the bed of lettuc Added avocado , diced tomatoes and drizzled a yougurt based avocado ranch. Couple squirts of fresh love lime and a dash of salt and pepper.. Amazing ! My new fave salad!